The third annual Texas Fly Fishing & Brew Festival will be held at the Plano Event Center, March 23-24, 2019. New at this year’s event includes a series of advanced courses for experienced anglers. Looking forward to spring fishing? Who isn’t? 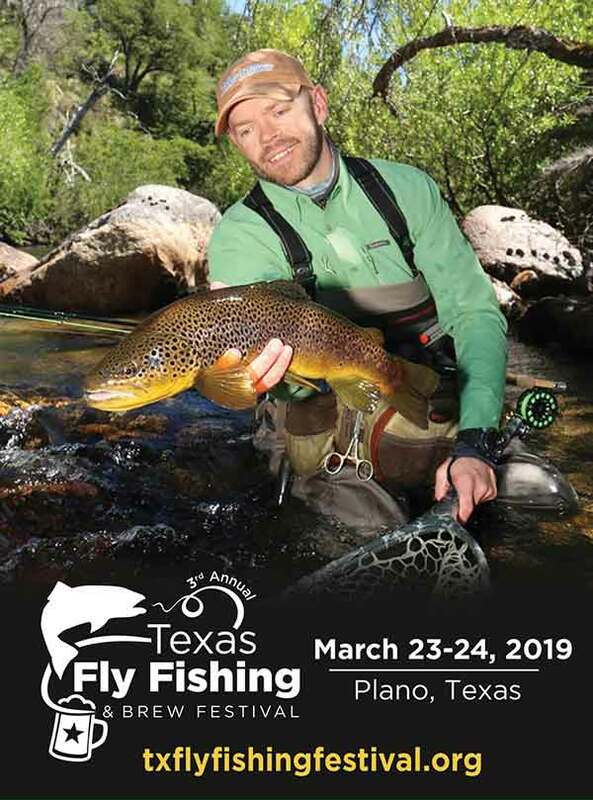 Fortunately for those of us still stuck in winter, the Third Annual Texas Fly Fishing & Brew Festival returns to the Plano Event Center on March 23-24, 2019. Unique to the Texas Fly & Brew is a focus on microbrewery beer. With their paid admission, festival attendees 21 years and older receive tasting tickets to sample a variety of locally handcrafted brews. Breweries selected to participate in this year’s event include Four Corners Brewing Co., Oak Highlands Brewery, Real Ale Brewing Co., Sweetwater Brewery, and Tupps. All of the participating breweries will have personnel on hand to explain what sets microbrewed beer apart, why and how certain ingredients yield different flavors, and how to brew and taste different types of beer. The festival’s microbrew component has become so popular that a waiting list now exists for breweries that wish to participate. “Introduction to Wilderness First Aid” by Mike Tayloe of Finns West teaches anglers how to respond to medical emergencies on the river. Author Mac Brown leads “Casting for Instructors,” a daylong advanced fly casting course for casting instructors. “Casting Big Flies for Big Fish” by renowned guide Blane Chocklett schools students in casting and fishing large fly patterns. Aquatic biologist Peter Stitcher teaches “Mayflies and Microbrews,” in which students enjoy a Texas microbrew while they learn to rapidly identify aquatic insects. In addition to these specialty classes for experienced anglers, the Texas Fly & Brew features fly angling experts offering tips and tricks suitable for everyone from the merely interested to the absolutely passionate. Headliners include Jason Randall, Ed Jaworowski, Dave Whitlock, Landon Mayer, Brian O’Keefe, Geri Myer, Joe Mahler, Steve Dally, Jerry Hamon, Fishy Fullum, Fred Hannie, and Matt Bennett. The Texas Fly & Brew kicks off on Friday, March 22 with a “Bass Bugs & Brews Night,” sponsored by the International Fly Fishing Film Festival. Group fly tying sessions will run from 5:30-7:30 PM at Tupps Brewery in nearby McKinney. Bass Bugs & Brews Night marks the first showing of an exciting IF4 movie in the Lone Star State: Special guest Cory Routh, producer of the award-winning movie Back Bay, will be on hand to share an exclusive, previously unseen excerpt of his movie featuring Lefty Kreh, believed to be Kreh’s last film interview. The excerpt represents Lefty at his best. The first 100 viewers will also receive the latest issue of Fly Tyer magazine. The evening will also feature a free raffle, with products from popular companies like Hardy, Umpqua, TFO, Snowbee, American Angler, and Norvise. Major sponsors of the Third Annual Texas Fly & Brew include Dallas-based fly rod manufacturer Temple Fork Outfitters (TFO), the Recreational Boating and Fishing Foundation (RBFF), Fish Partner, and Tailwaters Fly Fishing; additional sponsors include Gordy & Sons Outfitters, Reilly Rod Crafters, and the Texas Council of Fly Fishers International. A portion of the proceeds will be given to support Project Healing Waters programs in Texas. For more information, visit www.txflyfishingfestival.org or call 703-402-8338.